What business have Mrs. Artminster and her son Jerry in the Home Counties that necessitates a long stay in a small-town hotel in the off-season? The explanation they give the proprietor is obviously contrived, but he has his reasons for allowing them to stay. In Simon Gray’s first play for the stage—which opened at Wyndham’s Theatre on 10th October, 1967 with Sir Alec Guinness in the lead—the truth is complex and its revelation electrifying. “Wise Child is a clever, moving, perceptive and highly complicated examination of human relationships and emotional needs, with a plot quite subservient to it. Slowly, layer by layer you discover things in the two hotel rooms in which menace creeps up and claustrophobia stifles.” – Caren Meyer, Evening News. 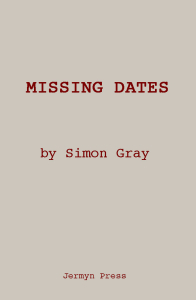 “…in Mr Gray..the theatre has discovered a writer of quality and consequence.” – Harold Hobson, The Sunday Times. Read an interview with Cleo Syvestre in which she talks about her experience acting in Wise Child. Wise Child is now available as a Faber Contemporary Classic in Simon Gray: Plays 1. To order a copy on special offer at 25% discount please contact Faber and use code GRAYPLAYS. Or check out the plays section of our website.